Our latest Calcbench research on leasing expenses is now available — and as a crucial new accounting standard for leasing costs approaches, you may want to give the report a read to see how our findings square with your company’s particular situation. We analyzed the leasing costs reported by more than 3,000 companies. In total, that group is carrying leasing costs with net present value of $860 billion, which are off the balance sheet. (Undiscounted leasing costs are $1.04 trillion.) The new standard for lease accounting, going into effect on Dec. 15, will force companies to report all those numbers on the balance for the first time. At some companies, those lease liabilities are multiple times larger than all other liabilities listed on the balance sheet. So as the new standard goes into effect, it could cause radical changes to what liabilities a company reports. We identified 24 firms whose leasing costs will increase total liabilities by more than 200 percent; two firms — Five Star Senior Living and Potbelly Corp. — will see increases above 400 percent. 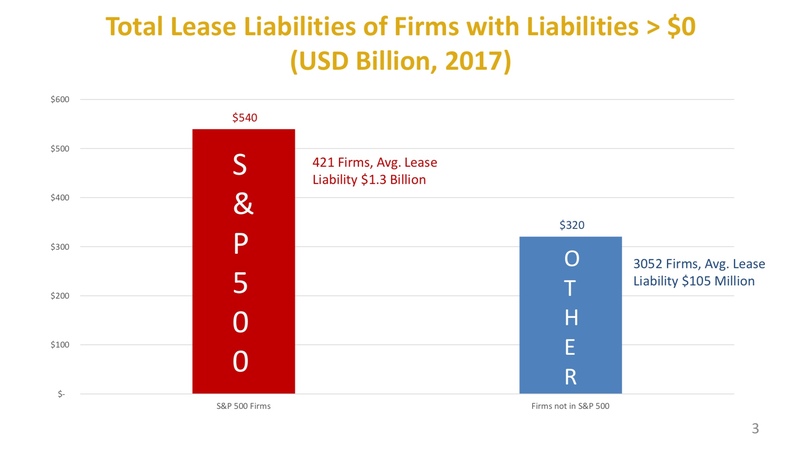 As you can see below, the bulk of those $819 billion in leasing liabilities are concentrated among the S&P 500; that’s not surprising. The $320 billion in liabilities for the other 3,000 firms we examined might not be a big issue, but the average liability is $105 million per firm. For some small firms, that’s a lot of money. Our report, which you can download on the always crackling Calcbench Research page, includes a list of the 25 firms with the greatest implied liability increase in relative terms; the 10 largest in dollar terms; a breakdown of leasing costs by economic sector; and a quick example of how to find these disclosures yourself using the Calcbench Interactive Disclosure tool. Remember, folks, that new standard goes into effect in four months. You can find all the data you want or need here at Calcbench.